by Luminare Fineart Editions, for a bank in Monetcito. 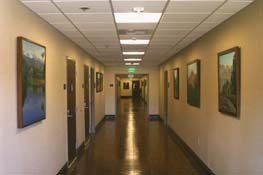 Working with Atsthetics Inc., 2 large fine art paper prints for the Glendale Adventists Medical Center. 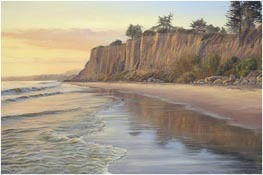 Aesthetics Inc Contracted me to create a diptych of Moonlight Beach in San Deigo, for a new waiting room at the Scripps Memorial Hospital in Encinitas. 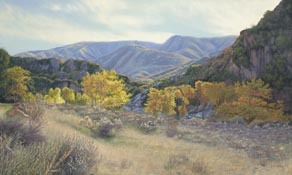 The original paintings are 30" x 40" oil on canvas. The 18" x 24" studies I painted to win the commission are available for sale. 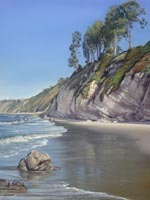 Working Robin Ficara Fine Art 340 Prints were made by Luminare Fineart for the Bacara Resort on the Gaviota Coast. 35 canvas prints for all the downstairs hallways. 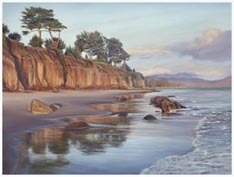 "Peace, A Quiet Evening" - Triptych -6'8" x 20'0"
Christine Flannery, the Art Director of Montecito Magazine called to discuss a commission to paint images for the Spring / Summer 2012 Edition of the magazine. She requested that I visit the Historic "Huskalow" Estate, a home designed by Reginald Johnson, located at the top of Mission Ridge in Santa Barbara. My husband Bill and I went to the home and met the gracious owners, Jim Knight and Janice Cook-Knight. They showed us through the house and around the property and we saw that there was a lot to paint. The views from this lovely property were breathtaking. From one side of the house I sketched the view from their courtyard across Santa Barbara to the ocean and Channel Islands. From the other side of the home we saw a spectacular vista of the Santa Ynez Range. After spending a wonderful afternoon at "Huskalow" we had sketches an photographs for many paintings. The hard part was to narrow down the concepts to a few that would best depict the essence of the property. 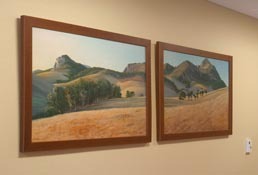 These five paintings were the ones I chose and the editors of the magazine used them all. 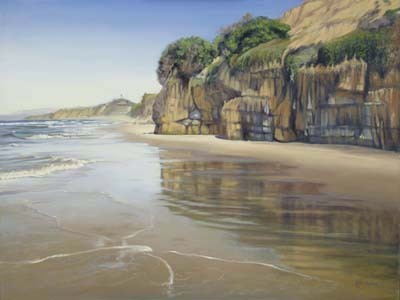 I have had the pleasure to do commissioned paintings for many of my clients. The client shows me the place of their interest. 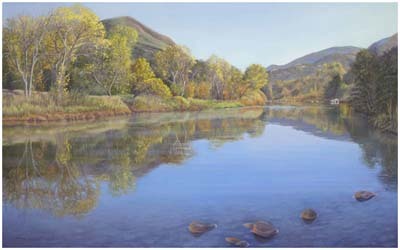 They may indicate the time of year and time of day that they enjoy being there the most. I will then go to the location and study the possible compositions in various light conditions. 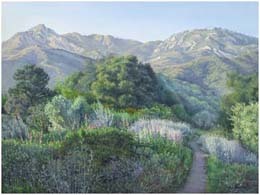 After sketching and photographing the area I return to the studio to create the painting. If the client likes the piece and wishes to purchase it, they can. If not, I have a beautiful artwork to add to my collection and exhibit elsewhere. 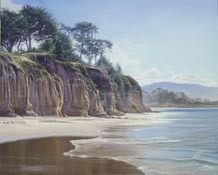 Telephone or e-mail me to discuss having a painting done of your favorite place. 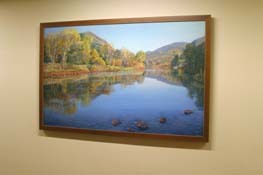 See examples of commissioned paintings below. 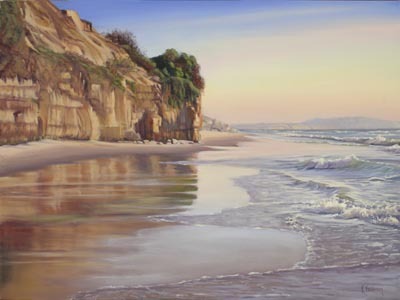 Several of these pieces have been used to create Limited Editions on canvas, which are available.